Defending champions Kvitova and Djokovic were great at Wimbledon, but now? WIMBLEDON – Last year in the 2014 Wimbledon final, Petra Kvitova didn’t look like nervous at all, or did she? The Czech crushed Genie Bouchard 6-3, 6-0 to win the title, and she was the champion of the world. She will let her teeth chatter, but not every week and once she manages to go deep at the major, she is much more comfortable. When she is ill and tired, she is gone, pretty quickly, just like the 2015 Australian Open, where she lost to the massive server Madison Keys in the third round, and at the 2015 Roland Garros, she ran into Timea Bacsinszky in three cold sets. The Swiss was enthusiastic, while Kvitova was fairly negative. Kvitova is happy off the court for the most part, but on court, she can get down on herself. However, the reason why she has won two majors at the All-England Club is because on the grass she touches her toes and she feel very light. She loosens up, cranks her serve and swings away. That is exactly what she did in Wimbledon, when she overcame Venus Williams 7-5 in the third set in the third round. She did not give away another set the rest of the way. She was playfull and simply brilliant. The men’s champion Novak Djokovic came into the press on Sunday, three weeks after when he lost in the final at Roland Garros against Stan Wawrinka. He decided not to play on grass at the tournaments before Wimbledon, but he did play an exhibition at Boodles this week. The No. 1 has been practicing on grass over the past 10 days and he says that he is refreshed after a long stretch on clay. But given that Djokovic was unable to win Paris once again was a crusher, given that all year he said that was his main goal. He has won every other major, but not on the red clay. This time, the nine-time Rafael Nadal went down in the quarters when Djokovic out-hit him. He beat Nadal for the first time at the French Open. Surely, he was going to win the title. But when Wawrinka knocked him way behind the court with some huge blasts he couldn’t move forward. Djokovic was shaky. So now is he ready to dance at Wimbledon again or will he fold? It’s a hard to say. “It was the finals, and that the most important match of the tournament for me. That’s the match that I wanted to win, but it didn’t happen, mostly because I lost to a better player that day,” Djokovic said. “I had to admit, no question about it, I could only just congratulate him because he was the one that was taking his chances, stepping into the court, being brave, coming up with some incredible shots. He deserved to win. “Maybe I could have done a few things differently. But it’s all behind me now. I’m experienced, and something that tennis has taught me over the years, to move on, and to be able to do that very quickly. You have two out of four most important events in the sport just within three weeks’ time. You need to be able to reset very rapidly and get yourself a new motivation and inspire yourself to keep on going. This motivation and faith has to be even stronger than it was three weeks ago. Wimbledon, Draw and Quartered: Serena vs Venus could happen in 4th round. Can Kvitova win again? Serena Williams is hands down the favorite at Wimbledon and while she was stunned by Alize Cornet in the third round last year, this time she won’t be nervous, which is why she has won three majors in a row: the 2014 US Open, the 2015 Australian Open and Roland Garros. However, this fortnight could be very tricky. She opens up against the young Russian Margarita Gasparyan who qualified and who has won a ton of matches this year. However Serena will batter her with some massive strokes. She could face the veteran Czech Petra Cetkovska who can also swing away, but she cannot put together ace after ace. The third round will be on the Centre Court for sure, when Serena could face Carolina Garcia (who can move quickly), Heather Watson (the Brit knows how to bend low), Daniela Hantuchova (who reached No. 4 ages ago) and Dominica Cibulkova (who is back and reached the 2014 Aussie Open final). Any one of those four could beat each other, but not over Serena, who will understand how exactly how to play any of those foes. Interestingly, the entire world is talking about the 33-year-old Roger Federer who still has a real chance at Wimby, but what about Venus Williams, who won five titles in the All-England Club? The 35-year-old won here for the last time in 2008, when she stopped Serena. She does has a small shot this year. She is not as fast as she used to, nor can she dominate with her serves as she can’t smoke her first serve over 120 MPH. But she loves the grass, which means she will try as hard as she can because she almost disappeared on the clay. She has a pretty good draw early when Venus will overpower the American Madison Brengle, and she could face one of the Italian veterans in the third round – Errani, Schiavone and Vinci – but none of them have ever figured out the grass. So then Venus will take on Serena, the only time they have played each other in the Round of 16 in a major. 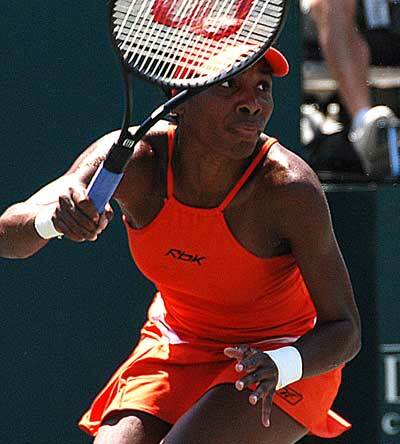 In 2005, at the US Open, Venus hit the lines and won. Serena is 14-11 head to head, but Venus did manage to overcome Serena in three long sets in 2014 Montreal. Yes, Venus knows exactly how to play her sister as they hit with each other for ages, but since around 2012 Serena had become substantially better while Venus has dropped off. While Venus will be close, Serena will be able to out-hit her with a more accurate forehand and these days, a better first serve and a much better second serve. Who will face Serena at the quarters? Three will pop up: Ana Ivanovic, Belinda Bencic or Victoria Azarenka. 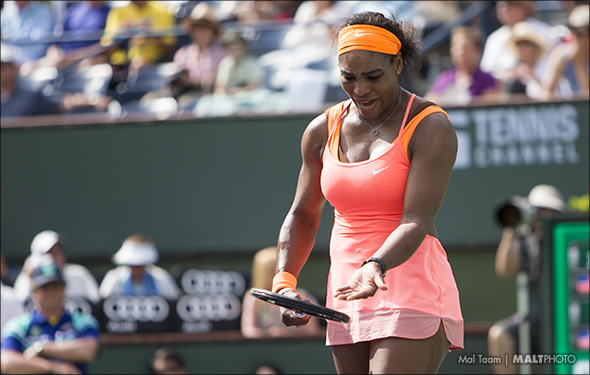 We know that Azarenka can push Serena to the wall, but Williams always seems to figure her out. Ivanovic and Bencic have played over the past five weeks but it is the young Swiss who is ready to jump out in front. Bencic will reach the quarters and, while she can mix it beautifully, she is not quite there. Serena will reach the quarters once again. Maria Sharapova hasn’t been able to win a second Slam at Wimbledon. She was a baby when she shocked the world in 2004 at the age of 17 and it looked like she would grab a few more. While she can crush the ball, she can fall down while sliding on the turf. But she has come close so perhaps she is ready to shine. She should be able to reach the quarters as she should be able to out-think Irina Begu in third, hit the lines over the very tough Flavia Pennetta or Andrea Petkovic in the fourth round. But, in the quarters, then she would have real trouble. He could face Lucie Safarova, who knocked him out in Paris and reached the final, or another Czech, Karolina Pliskova, who strikes viciously. And how about the rising Sloane Stephens, who reached the semifinal at Eastbourne? All three could upend Sharapova if she is off, but not yet because she was less than 100 percent when she was sick in Paris. Pliskova is ready to enter the top 10, and she looks very similar to Sharapova, but she isn’t mentally there yet. This time, Sharapova will go further and reach the semifinal. This is a toss-up, with Angie Kerber slightly favored because she looked very solid two weeks ago and now she feels like she’s isn’t in her head. She will likely play Garbiné Muguruza, who is terrific on clay, but she is not on grass. In the fourth round she will likely face Carolina Wozniacki, whose body is stiff and admittedly she has said that she isn’t very comfortable at All-England. Kerber will be just fine, who will dig low and bounce Sabine Lisicki in the quarterfinal, who could upset Simon Halep. The Romanian just fired her coach and she is very troubled. Lisicki is super- aggressive and has already thrown in some huge aces, but her so-called friend bothers Kerber to the point where she caves in. Kerber will reach the semifinals, fairly easy. The defending champion Petra Kvitova could grab Wimbledon again, but she is ill once again which means she is vulnerable. Yes the big lefty can dictate from the word go, but when she’s not 100 percent she doubts herself. That’s exactly what will recur. Yes, she should be able to reach the second week because she has sweet draw in the first three matches – like crushing Jelena Jankovic who doesn’t like the grass – but in the fourth round she is ready to be had. The will have to face Aga Radwanska, who has played quite badly this year (except at Eastbourne), but once she came on the grass she began to turn it around. She was all over the place this season, but she knows which way to go, and she can be very creative. Even though Radwanska is fragile, she will school Genie Bouchard/Madison Keys/Alize Cornet/ Ekaterina Makarova in the quarters. On hard courts, you would have to think that Makarova would out-punch the other ones, but she is erratic on the grass, so find another who will settle down and lock in. It should be Keys, who is a terrific serve and pretty darn good with her big strokes. The 2014 finalist Bouchard is completely out of it, so Keys will bang her head with Radwanska, but the Pole has too much experience and will reach the semis for the third time. Wimbledon: Draw & Quartered. Will Djokovic, Wawrinka, Murray & Federer reach semis? The No. 1 Novak Djokovic is the defending champion, so he is legitimately the favorite, but emotionally he must still be thinking about what occurred when he lost to Stan Wawrinka in the Roland Garros final. Even if he finally had grabbed his first title in Paris, he would still have a difficult draw in Wimbledon and that is the situation before him. He will play the former top-20 Philip Kohlschreiber in the first round, who can swing away when he is feeling healthy and very ambitious. Even if Djokovic beats the German, he would play the former 2002 Wimbledon champion Lleyton Hewitt, who is playing for the last time and while he isn’t playing well this year, the Aussie will push himself to the limit because he loves grass. However, Djokovic is faster and stronger over Hewitt. In the third round, the Serbian will win but will have to go five sets against Bernard Tomic, who should have been playing better over the past two weeks on grass. Tomic has reached the quarterfinals before and if he is churning, he could pull if off, but Djokovic knows how to bother him with his backhand and short slices. Djokovic will exhaust Kevin Anderson in the fourth round because he can return his biggest first serves and confuse the South African. But Djokovic will lose in the quarters to either Kei Nishikori, Marin Cilic or John Isner. Cilic and Isner will bomb away with their gigantic serves in the third round, but the Croatian will overcome the American in five sets. Then Cilic — who beat the Japanese in the 2014 US Open final – believes that he is ready to play perfectly again. But this time, Nishikori will dictate and win in straight sets. Nishikori is fast enough and he’s very powerful against Djokovic. If he can lock in early he won’t be upset mentally and disappear. He won’t and Nishikori will reach the semifinal. The RG defending champion Stan Wawrinka has never been great on the grass, but times have changed and he has a legitimate shot. He could face the fairly powerful Dominic Thiem in the third round and he should be able to win fairly easy as the young player is a bit sporadic. In the fourth round, he should also waltz past David Goffin, who doesn’t love the grass. But now the quarterfinal will be very difficult against one of these three: Milos Raonic, Nick Kyrgios and Grigor Dimitrov. Raonic reached the semifinals last year and while he is just coming back for the injury, the Canadian has all the tools to go further. He has a terrific serve, he can volley, and he knows how to keep the points short. He should be able to take down the former No. 2 Tommy Haas in the second round, and he will stay steady over the young and very promising Kyrgios. Then he will likely have to go up against Dimitrov, who also reached the 2014 Wimbledon semis. Last year, it looked like Dimitrov was ready to race into the top 5, but he has almost folded this year, which means that Raonic will club him when it’s very tight. Djokovic will go out at the quarters and so Wawrinka will too, when Raonic finally keeps on banging and he will meet Nishikori in the semis. Here comes the Britain Andy Murray, who has a pretty good draw early, but then he will get heavy work later. Murray should be able to school Mikhail Kukushkin to open, race past Robin Haase and then battle with the teenager Borna Coric or Andreas Seppi. Neither have the goods to unearth him. He may face Jo Tsonga in the fourth round, who can bang the serves on grass now, plus, at RG, the Frenchman looked awfully good. Yes on a great day he could shock Murray, but Tsonga has been hurt again so it is very likely that he will fold early. Murray could face Ivo Karlovic in the fourth round, who serves ace after ace until the sun goes out. Yes, Karlovic can bring Murray into every tiebreaker, but how is he going to return enough points and win three sets? He can’t do much after the rallies begin and he can’t jump his returns or way back on the baseline. Murray will take him down, on the tiebreaks or before hand. It appears that Murray will face the two-time Wimbledon champion by Rafael Nadal in the quarterfinal. The Spaniard has not played great this year, not on clay or the hard courts. He has not been terrible, but he has not been great, either. He believes he will get back to 100 percent soon. Perhaps he will, and there is no one around early who would will be able to upset him (including David Ferrer, whom they could play in the fourth round). Maybe he will be ready to go against Murray, blasting his huge lefty forehand and serves. Perhaps he will be running like the wind. But Nadal is not ready to pull out all the necessary steps yet. Murray will be more consistent and will win in four sets over Nadal, reaching the semifinal. Roger Federer has won seven titles at Wimbledon and even though he is 33 years old, he has it all the tools – but he has to play great the entire time because he is now a little slower. This is grass however and he can keep the points short. He cannot whale away, but he has the best serve and volley out there and he must decide to move forward. That is the only way he is going to win the title because the youngsters are now coming at him. In the second round, he could face Sam Querrey, who is a big server, but he can’t mix up against Federer, which is mandatory. Then he will likely go up against the 22-year-old Jack Sock in the third round, which could be very close if the American has learned to figure out the grass. He has become much stronger this year and he is pretty smart and he will dictate where he is going, but he is not quite there yet to stun the 17-time Slam champion. Federer knows exactly how to face another veteran, Feliciano Lopez, in the fourth round, who loves to attack, but he is up and down. In the quarters, the Swiss will go up against Tomas Berdych, Gael Monfils or Gilles Simon. Another Frenchman was hurt again – Monfils – but Simon has looked pretty good during the past week. However, Simon falls down in the Grand Slams and Berdych really likes grass. 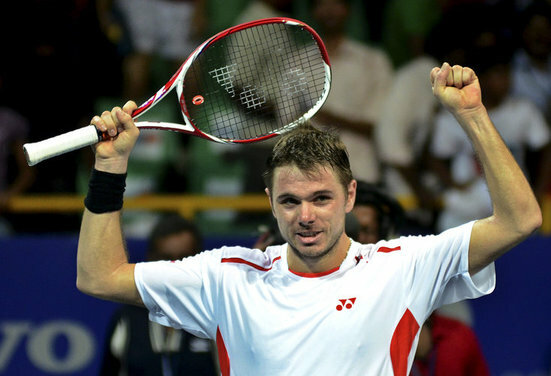 He has been extremely consistent this year and the Czech will face Federer, whom he beat once at Wimbledon in 2010. Federer was clearly irritated against Berdych in 2010 but he has not done it again. These days the Swiss knows exactly how to figure him out. Federer will reach a semifinal, once again. The Britain had to play very well in the last two sets to overcome Gilles Muller 3-6 7-6(2) 6-4. The lefty Muller kept charging, and Murray mixed it up, attacking early and making sure that he would be in charge. That was a solid win by Troicki beating John Isner 7-6(5) 6-3, who really has improved this year. He may not be the strongest player out there, but he is steady and he has become a better server. Murray has too much game on grass and will dismisses the Serbian in straight sets. This is a true pick-em, because Simon was very solid to best Milos Raonic, and the tall Anderson was more than respective as he rarely loses early. Simon seems to like the grass, and can skid around happily, but Anderson can crack serves and wind up and swing away from inside the baseline. Anderson will win in straight sets. Yes, Karlovic through bomb after bomb and he upset Tomas Berdych 7-5 6-7(8) 6-3, nailing 45 aces. Obviously, he was untouchable when he served, and he is pretty decent at the net, but Federer knows how to return. Plus, the Croat has never been able to make it to the semis at Wimbledon. Here in Halle, Federer realizes he has to be super patient, but he will and when the rallies begin he will yank him. Federer will win in straight sets. Nishikori has been pretty consistent this year, but his five set loss against Jo Tsonga at RG really hurt. However, on Halle he is moving quickly and he understands the grass courts. Seppi can be fun to watch, but he has yet to show he could knock out the top 10 guys on the super fast courts. Take Nishikori in straight sets. Both of these hitters aren’t that fast side-to-side, but they both have huge serves and can crack the balls from both sides. On grass, not only do you need to have a lot of aces, or un-returnable, but when you are returning the second serves, you have to make sure that you can go close to the lines or go extremely deep. Mladenovic is a fine volley, and she could upset one of the top 10ers at Wimbledon, but here, the Czech will take her out in three sets. The Frenchwomen upset Simona Halep, but the Romanian is fragile now and Pliskova – who smoked Carla Suarez Navarro – is just too consistent. The German Lisicki is serving bombs and it’s not just because “Boom, Boom” is crushing the lines, but because mentally, she is much more confident on the grass. Yes, Kerber is a better player overall, but Lisicki has reached the final before at Wimbledon and she likes bending down very low and whacking the ball. Lisicki will win in straight sets. 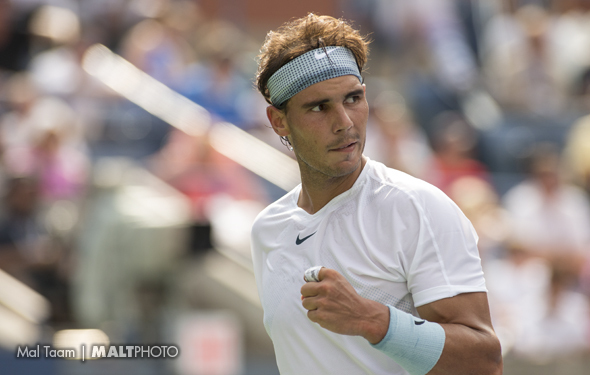 Notes on a Draw Sheet: Nadal falls to Dolgopolov; Nishikori vs Fed at Halle final? Rafael Nadal looked pretty good at Stuttgart, winning the tournament, but on Tuesday he lost to Alexandr Dolgopolov 6-3 6-7(6) 6-4 at Queens. 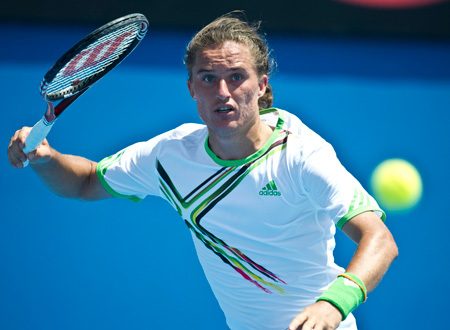 A few years back, it appeared that Dolgopolov was ready to charge into the top 10 because he has so much variety, but he is rarely consistent which is why he hasn’t been unable to push it deep into the Grand Slams. However, he was thoughtful over Nadal, so maybe he can win another match or two. The Spaniard is still not back to form. Yes, he is trying very hard to get back to No. 1, but he is ranked No. 10 now and he is up and down, which is why he was mediocre at best against Novak Djokovic in the quarters at Roland Garros. However, the former two-time champ at Wimby can do it again, but he has to become more aggressive and stop pushing the ball. It is very difficult to know how he will turn up, and whether he will unleash his fury. John Isner was satisfied in beating the fellow US male Jared Donaldson 7-6(11) 6-4. There is a lot of attention to the 22-year-old Jack Sock, but the 18-year-old Donaldson is tall and powerful. Just by qualifying at Queens gives Donaldson a heads up. Well what do you know, Ernests Gulbis beat beat Sergiy Stakhovsky 6-4 7-6(3). He is now ranked No. 86, way down from last year when he was ranked No. 10 after the US Open. He has lost pretty much everything, but he is much better than that. Maybe he is turning it around already…Kei Nishikori has a decent chance to win the tournament, if he can serve gigantic. He might face Roger Federer in the final. Nishikori beat Dominic Thiem 7-6(4) 7-5…Here is a good win by the American Steve Johnson, who beat Bernard Tomic 6-3 7-6(4). Johnson is a real scraper. I have been thinking that Tomic would go far on grass, given that he has reached the quarters at Wimby, but now I am not so sure. Last week he lost against Nadal, which is always difficult, but the 22-year-old should be ready to take down the very best. We shall see, very soon. 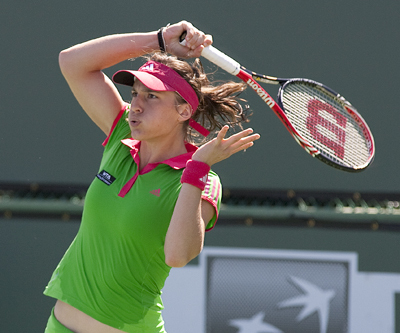 WTA: Petko is stymied again. Is Victoria Azarenka is really ready now? This is a perfect opportunity to win the title. Yes, she doesn’t love grass, but she knows it much better now because she understands the surface. The former No. 1 edged Varvara Lepchenko 7-6(7) 6-4 and now will face Zarina Diyas. Azarenka should be able to over power her, but she must be able to bend low because that is what grass is all about. Here is the pic of the day, when Genie Bouchard goes against Kristina Mladenovic. The Frenchman beat the Canadian in the first round at RG on clay, and now Mladenovic is ready to swing away and she will believe that Bouchard will become nervous again. Clearly, the Canadian is lost out there. She can play extremely well, just like when she reached the 2014 Wimbledon final, but after that she was no longer just thinking about the ball. This year, she managed to win two matches at Indian Wells in early March, but then she lost a marathon match against Lesia Tsurenko. After that, she has gone two wins and seven losses, including last week against Yaroslava Shvedova in the Netherlands, when she fell 6-4 1-6 6-4. She had a real chance in the third set, but she froze. Without a doubt, her coach, Sam Sumyk, is encouraging her to focus on the ball and nothing more. It has to come now, and given that thousands of fans will unlikely be suspicious of her on Ann Jones Centre Court, she should be ready to hang in there. She is very fast, she can play inside the baseline and she can return with authority. Of course, Bouchard has to keep the balls in the court. She will chatter her teeth at the end, but she will make it through in three tight sets. JUNE 12- Stuttgart again? My, maybe someday Germany will be in the Masters 1000 ATP again, as well as the WTA Premier Mandatory. Stuttgart already has a WTA tournament during April on clay indoors, which had a ton of fans. This week, at Mercedes Cup in Stuttgart, there is a very good selection, which is unusual given that it’s the week after Roland Garros. But now things are different, as for the first time, Wimbledon is three weeks ahead, not two weeks, so the players have more time. That is a good thing. Rafael Nadal, who lost against Novak Djokovic in the quarters at RG, is ready to rumble. He is not perfect – he’s not even close – but little by little he is improving. On Friday, he bested Aussie Bernard Tomic 6-4 6-7(6) 6-3, which was good enough. Tomic has been pretty consistent this year, but he has not been able to overcome the big boys. Still, he is very creative and the No. 24 has a decent shot at Wimbledon to reach the quarterfinals, or the semis, but he has to step it up and really believe in himself. Nadal can win Wimbledon once again (he has won the Slam twice) but he has to grab a title before he gets there. How about this weekend in Stuttgart? The No. 10 will face Gael Monfils, who beat German Philipp Kohlschreiber 7-5 3-6 6-3, which could be a terrific contest, but the Frenchman is hurt once again and it’s impossible to know how he will turn up. Recall that in RG, Monfils looked like he was ready to shine against Roger Federer, but in the second day his legs were sore and he was gone. That is what will happen in the semis when Nadal will win in three sets as Monfils was hurting once again. Here is another: the former US Open champion Marin Cilic will face Victor Troicki in the semis. This summer, he is trying hard to get back after he missed most of the fall and the first quarter this year. He can serve huge. He will overcome the consistent Troicki in straight sets. In the WTA, the Topshelf Open at the Netherlands has a dramatic day when the teenager Belinda Bencic beat Kristina Mladenovic 7-6(4) 6-7(4) 7-5, and Camila Giorgi overcame Yaroslava Shvedova 4-6 6-3 7-6(9). Bencic should be able to make the top 32 at Wimbledon or better but she will have a hard time in the semis against Jelena Jankovic, while Giorgi will be pretty tired against the local hero, Kiki Bertens. You have to like the veteran Jankovic as well as Bertens will here the fans cheering for her. In Nottingham, Agnieszka Radwanska beat Lauren Davis 6-2 6-2 and perhaps she is feeling a little better now after an awful season. She does love grass and she will face Monica Niculescu, who is pretty decent. For Radwanska, winning against anyone, anytime is mandatory. If she wins the event, then we are talking about her once again. Report Card, women at Roland Garros. Serena gets an ‘A’ but what about Safarova? In 2015, she has never had to struggle as much as she did at Roland Garros, very sick and completely out of it. But, when she came on court, one way or another, she was going to find the right place. Serena has won plenty of Slams over the years, but she has never played three-setters in five matches, which were all against the hot and ambitious players. She didn’t just blast huge serves, but she mixed up her attack, ran down the balls even though it appeared to be out of reach and when she was down 2-0 in the third set against Safarova, she woke up, yelled at herself every second and quickly rose to the heaven. Yes, Serena can be had if she isn’t feeling right, but she wants to tie against Steffi Graf at 22 majors this year and when she faces Wimbledon and the US Open, she will be locked in. The 28-year-old lefty has been around for a long time and for the first time in Paris, she didn’t get nervous or stop thinking. Both her forehand and backhand are more powerful, she has found much better angles and she knows how to strategize. Her biggest win was in the fourth round when she upset the defending champion Maria Sharapova in two excellent sets. Maria tried to stare her down and she could not, as Safarova looking right back at her and said, “I am still here.” Now the question is, can she go deep at Wimbledon once again? The Swiss isn’t that young (she is 26 years old) so it’s not like she has come out of nowhere, but when you watch her you can see that she ripped both sides down the line and she has a pretty good first serve. She upset the defending Wimbledon champion Petra Kvitova, which was huge, and she didn’t stop there, reaching the semis before Serena stepped on her in the third set. But now it looks like we will see her in the top 20 for years to come. The Serbian had a real chance to reach the final again, but she wasn’t there against Safarova. She fought very hard during the tournament and she was dominating with her ferocious forehand, but she was nervous when she knew that she could win the title. Can she recover? The 21-year-old’s performance was completely unexpected, as she upset at the Frenchwoman Kristina Mladenovic and beating the other unknown Andreea Mite to reach the quarters. She has much more belief now. It’s not easy to gain to a fourth round when you entered the tournament ranked No. 100, but she did, stopping Karolina Pliskova and Francesca Schiavone. It appears that the 21-year-old from Romania is now here to stay. She played very well to beat Giorgi, Kerber and Pennetta, but she wasn’t quite there when she lost to Safarova. Still, the 21-year-old is coming along nicely. The 20-year-old did a fine job reaching the quarters, outhitting Cornet. Little by little she will stay in the top 20 – or the top 10 – for a long time to come. Yes, just reaching the fourth round is not the biggest deal, but being able to play in front of the Frenchy crowds during the second week made her cry with a wide smile. The Italian looked shaky entering the RG as she lost early in Madrid and Italy. But in Paris she scored wins over Germans Petkovic and Goerges to reach the quarters, but then Serena crushed her. Yes, Sloane was unable to upset Serena in the fourth round, but at least this time she was very close and she showed that now she doesn’t fear the top players. The German pretty much owns Wozniacki, out slugging her in the second round, but she was anxious when she lost 6-2 6-2 against Errani in the fourth round. The 25-year-old American hasn’t loved clay over the years, but she did good job in Paris, reaching the third round for the first time. OK the No. 8 Russian doesn’t love clay, but at least she managed to get to the fourth round, where she lost to Ivanovic. That is about as good as she could get. Sure she was super sick, but she had opportunities against Safarova in the fourth round. The 2012 and 2014 champion was disappointing, but at least she tried as good as she could. However she needs a huge win at Wimbledon. The former top 10-er had a big win over Suarez, but then the veteran was so-so in losing against Muguruza. It was cold during the first week and she struggled. However she had battled and reached the fourth round, looking she had a real chance to reach the semis or better. But, during the third set against Bacsinszky, she melted. That is Petra, you never know where the ball is going. The promising American has yet to figure the red clay, which is why she went down to Timea Bacsinszky in the third round. Patience, please. Ye,s the former No. 1 is trying this year, but she is not there yet, falling against Serena in three sets. She had chances, but she lost her cool. The German has been hurt over the past two months, so reaching the third round wasn’t so bad. It looked like the German could go far until she fell apart in the second and third sets against Muguruza. Where is she going now? It has been a rough year on clay for the elder Williams and, while she tried against Sloane Stephens, she was all over the place. I really like the No. 12 this year overall but she is too slow on the clay, which is why she was stunned by Mitu. Yes, her opponent, Mirjana Lucic-Baroni, can go for it and she was super aggressive, but Halep was unconvincing in the second round and didn’t change up at all. That was a serious blow to the 2014 finalist. Caro looked OK to best Karin Knapp in the first round, but then she hit way too short and she was punched out against Goerges. She just does not know how to play the clay. Clearly the Canadian is trying very hard but it is in her head now and she gets super nervous when she is out there playing. As she admitted she can’t handle the clay, but she is better than that when she is into it. She wasn’t at all when she loss to Annika Beck in the first round. Trying hard is mandatory. He owns a gigantic forehands, amazing one-handed backhand, he has improved his serves and he is very confidant, plus he truly believes that he can beat anyone when he is on. He sure was when he won his second Grand Slam, out-thinking and out-hitting Roger Federer, Jo Tsonga and Novak Djokovic in the final at Roland Garros. Mentally, he can go up and down, but game-wise if he’s on, the 30-year-old can grab even more majors. Who would have thunk it? As terrific as Djokovic is, he can be rattled, which is why in the final he wasn’t aggressive enough. He wept, which is too bad because he tries every time and he rarely loses. The No. 1 will have another chance next year to try and win RG for the first time, but on clay against the other top guys, he can’t stand way behind the baseline and just hope. Finally, Murray changed his approach to clay and he was much more confidence and lethal. He is not perfect on the dirt and still need to improve, but next year he might have a real shot at RG…if he figures out how to beat Djokovic. Yes, Tsonga could have re-thought his return of serves against Wawrinka, but overall he dominating his serves, forehands and the net. However he has to continue to improve his backhand if he will ever win a Slam. All of a sudden, the young American looks like he can reach the top 20 for sure after reaching the fourth round at RG. His strokes and his serves are gigantic and he went toe-to-toe against Nadal for a little while. He still has a lot of work ahead. The 19-year-old Aussie reached the third round and served bombs in a 6-4 6-4 6-4 loss to Djokovic. Plus he beat Bernard Tomic in five sets. That’s pretty good for the kid. OK the Spaniard should have been able to bring Murray to five sets, but the 33-year-old never gives up which is why he is still in the top 10 even though he has slowed. The Croatian disappeared after winning the 2014 US Open title, as he was hurt and barely played until last month. At least he made it to the fourth round at RG and while he looked pooped against Ferrer, during the first week he showed that he is coming to life. No one expected the Frenchman to reach the Round of 16, upsetting John Isner and David Goffin. At times, he can be super powerful and consistent. The 18-year-old Croatian is already powerful and strong even though he is still growing. Beating the veteran Tommy Robredo in five sets was huge. The other teenager managed to make it to the third round and had he not been hurt, he might have been able to grab a set or two against Murray, but the older chap is too smart. We’ll see what happens next for the Australian. He played well to reach the third round, which was good on clay, but he was unable to grab a set. But, then again, he lost to the eventual, so that was fine. OK ,the Japanese made it to the quarterfinal, which is OK, but was he strong enough to out-run against Tsonga in five sets? He is close to winning a Slam but not quite yet. The tall American played pretty well on clay in Europe, but he was unable to knock down Chardy, which was surprising. The Frenchmen won two fun five-setters early on, which was a blast, but after splitting sets against Federer the next day he looked sore and he was gone way too quickly. For the most, the 14-time Grand Slam champion looked very good until he had to face Djokovic, who had beaten Novak six times prior in RG, but he was very short and he was not very accurate. Right now, he isn’t very confident. The great Swiss is clearly declining at the majors, which is why he went down in three sets against Wawrinka, who he has owned him katekt. But at 33, Fed can still beat anyone outside of the top 10. He is beautiful to watch when he is on but he was crushed against Wawrinka, and I mean absolutely crushed. Ranked No. 4 coming into the tournament, the Czech looked pretty good all over but he looked very frustrated on Chatrier against Jo. He really wasn’t there. It’s one thing to reach the round of 16 because he has been hurt much of this year, it’s another to go down against Djokovic 6-1 6-2 6-3. The No. 32 lost to Benjamin Becker on clay when the German barely won a matches this year and never did well on clay? How? Serena vs. Safarova in Roland Garros Final: Is she super sick? DAY 13, ROLAND GARROS – Serena Williams is sick, badly sick, which is why she didn’t show up to Roland Garros on Friday, saying that she needs to lie on bed and rest. Clearly, she was ill during her three-set win over Timea Bacsinszky, looking like she would vomit, or collapse, or just give up. But she hung in there and played an excellent third set and raced away. So now, will she be OK more or less when she battlesLucie Safarova during the final? Perhaps not, but after two days, she will feel a little better and she will be ready to rumble. The 19-time Grand Slam always finds a way and she will need to. Safarova hasn’t played much better this year and during the past 13 days, she has been outstanding, knocking off Maria Sharapova, Garbine Muguruza and Ana Ivanovic, which is darn good. Safarova has improved her angles, from both her forehand and backhand, she can go down the lines, she is pretty fast and when she really wants it, he can kiss the lines with her first serves. Plus, her doubles have improved (she is in the final with Bethanie Mattek-Sands) which has helped her at the net. Serena is bigger and stronger but she has struggled during the fortnight, having to win four three-setters. She will have to do it again, and this time she will have to go up into the wall, but once again Williams will win her third Roland Garros, her 20th Grand Slam overall. By the end of this year, she could have tied with the legendary Steffi Graf at 22. Who would have thunk it? Novak Djokovic versus Andy Murray will continue on in the semis with the Serbian is up over the Scot 6-3 6-3 5-7 3-3. Murray came roaring back, but Murray had a big chance up a break early in the fourth set and let it go. If Murray can upset Djokovic (and yes Novak has beaten him seven matches in a row), he has to go super strong in the beginning. On Saturday, the will start at 1 pm. Stan Wawrinka took down Jo Tsonga in four sets in nearly four hours. The Swiss has the best one-handed backhand in the business now, better over his buddy Roger Federer on that side over the past two years. However, Stan is way up and down and while he can whale from every side, we have no idea who is going to show up. We assume he will be happy, he will be fine and ready to go. He hopes. But if he is in the zone, he could beat either Djokovic or Murray to win his second Slam title. Lucie Safarova vs. Ana Ivanovic reach Roland Garros semis, who will be calmer? Roland Garros, June 4: Lucie Safarova and Ana Ivanovic have known each other for a long time, since 2007. Back then few knew who they were and they played each other in front of almost no one on a hot, smoggy day in Los Angeles, where Ivanovic prevailed 6-2, 6-2. There was no way to predict whether the teenagers would ever meet in the semifinals of a Grand Slam tournament, but if you looked them in the eye, you could tell they were burning for desire. In 2008, Ivanovic was already coming hard and she was at Roland Garros, crushing Safarova 6-2, 6-1 in the fourth round and eventually won the tournament. Ivanovic was never nervous; she was flying high, she was No. 1 and she could stay there forever. But the world now knew who she was and there was tremendous attention and pressure. Within a month or so when she hurt her hand, she thought about every match, every moment, what she should be doing and what her opponent were thinking. She became was too emotional — too much and she began to slide, way down. Safarova wasn’t moving up the charts quickly, but the left-hander knew how to handle herself. On hard court, she pulled Ivanovic around, attacking her backhands, winning in Toronto and Tokyo in 2009. In 2012, Safarova had improved her first serve and forehand, beating Ivanovic in Sydney and then in the Fed Cup final at home in Prague, she won it 6-4 6-3, with aggressive net play. Safarova was the hero, taking down Jelena Jankovic and Ivanovic when the fans were very loud and she knew that the pressure was on top of her. But she loved the glory because the Czech Republic does not have a big WTA tournament and many knew about her compatriot Petra Kvitova, who had won Wimbledon twice. But Safarova wanted the fans to know about her, too. She was gaining, little by little, and by 2014, both players were feeling confident. They were not playing perfectly every week, not by a long shot, but their self-reliance was growing. In the 2014 French Open, Safarova was ranked No. 22 while Ivanovic was ranked No. 13. They met in the third round and for the second time they faced off, where once again, Safarova was very comfortable and on clay, she beat the 2008 champion 6-3 6-3. The right-handed Ivanovic slugs her forehand about as hard as she can and she moves left quickly, ready to jump. But sometimes she gets caught and hits the ball the wrong way. She gets anxious and then she isn’t sure how to attack. In October, though, on hard courts, Ivanovic smashed Safarova 6-2 6-2 in Tokyo. Ivanovic could reach the top 5 again, ifshe wasn’t up and down all the time, became calmer, came to the net more and found more consistentency with her backhand. She went 2-1 at the WTA Final (although she wasn’t able to reach the semis) and at in the beginning of January, she reached the final of Brisbane, where she was close against Maria Sharapova. But after that, she slipped again, changing her tactics way too much. She left her coach in early May, and she decided she would be out on her own, making her own way. In the last 10 days at Roland Garros, she fell in love in Paris and now she is the favorite at the semifinal as she has been here before. However, Safarova takes a long time to decide when she would go for it against the very good players. Last year, she reached the semifinal of Wimbledon falling to Kvitova, but this time she was willing to knock off very sharp angles and also go down the lines. Last November, she and the Czechs won the Fed Cup at home again, over Germany. Here in Paris, Safarova knocked out two huge hitters, Maria Sharapova and Garbine Muguruza, and she isn’t getting nervous at all. She still in the doubles too, with her partner Bethanie Matter-Sands, who upended top-seeded Sania Mirza and Martina Hingis. The semifinal will be super close, but in the end, Safarova will kill the corners and overcome Ivanovic in three sets. What a nice story by Timea Bacsinszky but Serena Williams is a substantial favorite to win her 20th Grand Sla title. The Swiss is pretty fast and she seems to understand the court, but is she ready to win a very important semifinal and not be nervous? Even if she is having a great time, that’s doesn’t mean that she can actually beat Williams. Novak Djokovic was spectacular. Mentally, he was finally able to play the right way, he wanted to play against Rafa Nadal, beating him on his own punch. His serves were much bigger and closer to the lines, his backhand was deeper and more consistent and he was just as good if not better with his forehand. He did everything right. The Spaniard Nadal finally let down deeply at Roland Garros for the first time. Yes, the nine-time RG champ did lose to Robin Soderling in 2009, but he was a bit closer and this time, after the first set, he wasn’t confident enough and by the third set he was completely gone. If he wants to have a chance at Wimbledon or the US Open, he has to play much better. He has to step up and believe in himself again. Perhaps it will take him the rest of the year. Djokovic is a substantial favorite of Andy Murray, who beat David Ferrer 7-6(4) 6-2 5-7 6-1. Yes, Murray has improved on the dirt, but he hasn’t beaten Djokovic since 2013 Wimbledon and that’s almost two years ago. If Murray doesn’t play a super aggressive contest and mix it up from all the angles of the court then he will have no real shot. He will try hard though.